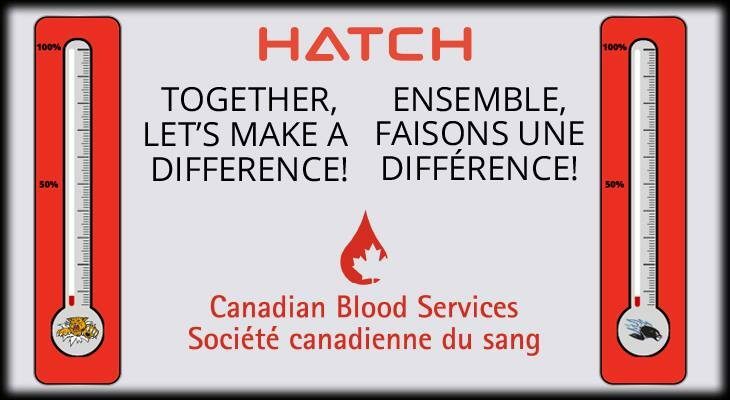 The Saint John Sea Dogs and the Moncton Wildcats, in association with engineering firm Hatch and Canadian Blood Services (CBS), are teaming up to hold the “Community Rivalry” blood drive during the month of January. Saint John has a goal of 384 donors between Tuesday January 3rd, and Tuesday January 31st, 2017. Moncton’s goal is 976 donors. Both CBS locations will feature a thermometer which will track the number of donations throughout the month. Fans visiting the Canadian Blood Services location in Saint John, will be entered to win one of 20 weekly pairs of tickets for the game on Friday, February 10th, against the Drummondville Voltigeurs, courtesy of Hatch! There will also be a grand prize draw for an autographed Sea Dogs jersey, drawn at the game on February 10th. The Sea Dogs will hold a special meet-and-greet on Thursday, January 26th, from 4:30-6 pm at CBS Saint John, 405 University Avenue. Players and staff will be there for autographs, pictures and to support the community’s efforts in giving blood! “Being established in New Brunswick for over 50 years, we are very pleased to partner with the Saint John Sea Dogs during the month of January to assist the Canadian Blood Services (New Brunswick section) to promote blood donations to help meet the rising demand for blood,” said Nancy Frechette, Vice-President Infrastructure at Hatch. To be a part of this wonderful community initiative and to save a life today, please visit Canadian Blood Services, 405 University Avenue, Saint John. Canadian Blood Services is a not-for-profit, charitable organization operating at arm’s length from government. Its sole mission is to manage the blood supply for Canadians. Created in 1998, it is the successor to the Canadian Red Cross Blood Program and the Canadian Blood Agency (the former funding arm of Canada’s blood supply system). Canadian Blood Services operates Canada’s blood supply in a manner that gains the trust, commitment and confidence of all Canadians by providing a safe, secure, cost-effective, affordable and accessible supply of quality blood, blood products and their alternatives. With over six decades of business and technical experience in the mining, energy, and infrastructure sectors, Hatch knows your business and understand that your challenges are changing rapidly. Our employees are determined to create positive change by offering community support, environmental sustainability, and maintaining sustainable relationships with all those who are engaged with our firm.